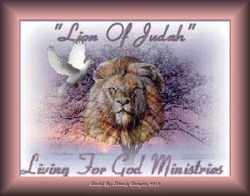 Welcome To "Living For God Ministries"
This site is dedicated to our Heavenly Father/YHWH, Yeshua/Jesus our Messiah/redeemer His Only Begotten Son And The Ruach Ha'Kodesh/Holy Spirit. We seek to expose the lies of the enemy and set free those held captive, bringing the truth of God's word to all who have an ear to hear! "For those who are free through Messiah/Christ, are free indeed"
May Blessings And Shalom Be Given To All Who Enter!
" We Are Soaring On Wings As Eagles"
and they shall walk and not faint"
"Come unto Yeshua/Jesus and rest in the oasis of his shalom, love and healing"
"The word Internalized, is the enemy Neutralizied"